Directors were in receipt of a proposed strategic plan for 2016-2017 organized under the five strategic pillars of the Blueprint. The Blueprint: CHI will continue mapping its strategic plan and its projects to the objectives of the Blueprint keeping the Blueprint as the central theme for seminars and information exchanges. Communications: staff reported that CHI will continue to improve its communications program over the next two years by expanding the scope and reach of our website and by using regular e-bulletins to better inform and engage our members. Collaboration: CHI will strive to expand its collaborative work to include not only bodies within the Alliance but also other housing organizations that are dedicated to co‑operative housing and/or that share the vision and values of co-operatives. Growth: CHI will develop a membership recruitment and retention strategy in collaboration with the Alliance staff and board. We will make outreach to under-represented regions a priority and we will ask the Alliance’s regional offices to assist us. Governance: Nicholas Gazzard requested that all directors strive to work more actively together. CHI will work to secure our future leadership and improve its diversity through succession planning. Julie LaPalme reported on the summary of core activities and proposed projects for 2016. Raise awareness of CHI within member and non-member countries and ensure adequate staffing to support all core activities and special projects. Hold two face-to-face meetings – Berlin in the spring and Geneva in the fall. Publish two CHI e-bulletins highlighting 2016 work themes. Update online version of the country profiles. Partner with co-op housing organization to produce a pamphlet highlighting professional development options for co-op housing managers. Organize a seminar in collaboration with Housing Europe meeting in 2016 on Sustainable Economic Success: Comprehensive Asset Management and Long-term Financial Planning. CHI’s value to its members depends on an excellent communications programs. We will expand and enrich its communications program over the next two years by expanding the scope and reach of our website. We will use regular e-bulletins to better inform and engage our members. We will make use of non-traditional media to reach a wider demographic within the co-op housing movement. We will survey our members to learn more about their priorities and activities. And we will make a point of sharing our progress among the Alliance and its constituent bodies. Social media is one of the most powerful tools in our marketing arsenal. Before diving further into social media we need a clear plan. Set objectives directly tied to our goals, and they should be achievable. We need to have an ongoing presence on social media, and that includes delivering fresh content on a regular basis. Nicholas Gazzard presented the proposed topic for the 2016 symposium to the board for approval. The topic is Long-term economic sustainability for housing co-ops. The directors were in receipt of an oral report on the New Guidelines for Co-operative Principles from guest David Rodgers. 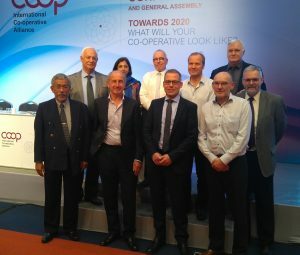 David reported that at a special meeting in the General Assembly in 2012, membership of the Alliance gave ICA a mandate to provide new guidelines for co-operative principles. David explained that he had been asked to review and edit the guidance notes. Guidance notes are to be used as a reference guide for co-ops. Under direction of the Principles Committee, David edited and revised the guidance notes, creating a new version called New Guidelines for Co-operative Principles. Copies of the Guidelines were available for directors at the meeting. Refugee crisis is having a strong impact on housing co-ops. It is expected there will be 60,000 refugees in Germany by the end of 2015. This is a problem in some states because there are no vacancies in the housing market. It is very possible there will be as many as 300,000 refugees by the end of 2016. Anticipating integration into schools/work force will be a huge problem in the coming year. Currently there are 120,000 vacant units in Germany, but this will not be enough to house the expected number of refugees by the end of 2016. The refugee immigration situation is similar to that of Germany. There is already a housing shortage in Sweden and the refugee crisis will create an even greater shortage. The fear is that we will have to close our borders. 500 refugees per week are entering Austria. 5,000 to 10,000 refugees have claimed refugee status in Austria. Housing is a problem for them as there is a shortage of affordable housing. Austrian co-ops are experienced at building communitie. Turkey has received 3 million Syrian refugees, most living in camps. Some went to vacant houses because they couldn’t afford to pay rent. When refugees began to find work they were able to pay rent but the number of refugees was so high that there was not enough housing available for rent. Even if the refugee situation is temporary, there should still be a solution for dealing with it. No one will want to return to Syria if there is nothing to return to. 30,000 refugees from rural areas entered Pakistan. Tagged as Pakistanis they had many family members and brought all of them with them, this created huge housing and unemployment problems. The discussion in Norway is about how many refugees to accept. 8,000 refugees over two years but the situation is much worse now. 3,000 new units being built this year. The British government is failing to respond to the greatest humanitarian problem. To date Britain has only received 200 refugees. He suggests that co-op members use their resources to create/integrate refugees into co-op communities. Agreed with David to discuss ways to work together to help the migration /integration of refugees into co-op communities.